Let us commend to Jesus Christ and His holy Mother the souls in Purgatory, in particular those of our relatives, benefactors, friends, and enemies; especially those for whom we are bound to pray; and let us offer the following consid�erations and prayers for them, pondering over the great sufferings which these spouses of Christ endure. Manifold are the sufferings which those blessed souls must endure, but the greatest of all is the reflection that their sins in life are the cause of their present torments. O Jesus, my Saviour, I have so often deserved to be cast into hell; how great were my suffering if I were now cast away and obliged to think that I, myself, had caused my damnation! I thank Thee for the patience with which Thou hast endured me. My God, I love Thee above all things and I am heartily sorry for having offended Thee because Thou art infinite goodness. I will rather die than offend Thee again. Grant me the grace of perseverance; have pity on me, and at the same time on those blessed souls suffering in Purgatory. 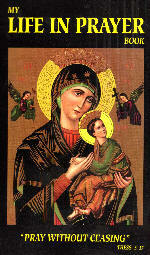 Mary, Mother of God, come to their assistance with thy powerful intercession. PRAYER TO OUR SUFFERING SAVIOUR FOR THE SOULS IN PURGATORY. To be repeated every day during the Novena. V. O most sweet Jesus, through the bloody sweat which Thou didst suffer in the Garden of Gethsemani, have mercy on these blessed souls. R. Have mercy on them, O Lord have mercy on them. V. O most sweet Jesus, through the pains which Thou didst suffer during Thy most cruel scourging, have mercy on them. R. Have mercy on them, O Lord, etc. V. O most sweet Jesus, through the pains which Thou didst suffer in Thy most painful crowning with thorns, have mercy on them. R. Have mercy on them, etc. V. O most sweet Jesus, through the pains which Thou didst suffer in carrying Thy Cross to Calvary, have mercy on them. V. O most sweet Jesus, through the pains which Thou didst suffer during Thy most cruel Crucifixion, have mercy on them. V. O most sweet Jesus, through the pains which Thou didst suffer in Thy most bitter agony on the Cross, have mercy on them. V. O most sweet Jesus, through the immense pain which Thou didst suffer in breathing forth Thy blessed soul, have mercy on them. Blessed souls, we have prayed for you; we entreat you, who are so dear to God, and who are secure of never losing Him, to pray for us miserable sinners, who are in danger of being damned, and of losing God forever. Amen.